5N Light Chestnut (150 ml). 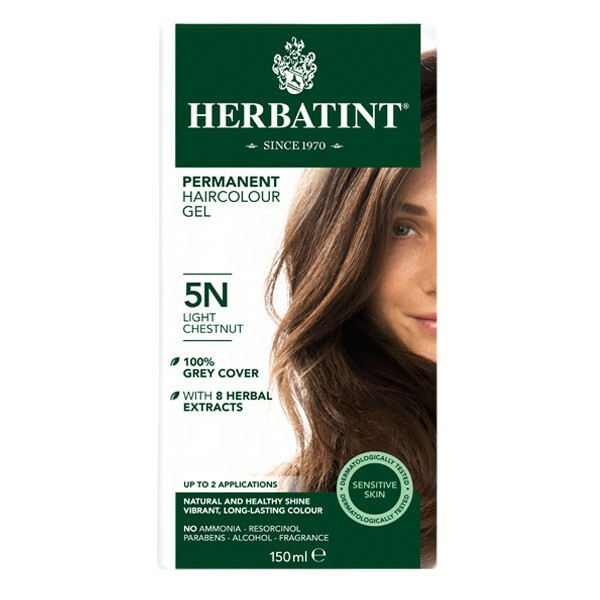 Herbatint is the most natural permanent hair dye available in South Africa. It contains no Ammonia, no Resorcinol and no Paraben, and the lowest possible levels of Peroxide and PPD, meaning it is a lot safer for you and a lot gentler on your hair with no smell and no burning sensation. Herbatint uses herbal extracts to achieve a beautiful, completely effective permanent colour ? without damaging the hair structure ? while nourishing, protecting and conditioning the hair and scalp. Herbatint 5N covers grey 100% on its first application. With 8 herbal extracts instead of chemicals, this product is recommended for sensitive skin. Herbatint is not tested on animals, is certified by PETA and adheres to FSC standards and ingredients are Gluten Free. Herbatint has been the undisputed market leader for more than 40 years. It has gained a deserving popularity and is now sold in 38 countries around the world. This extraordinary formula is able to assure the perfect coverage of grey hair from the very first application without damaging the hair structure and yet providing extremely natural looking results. The Herbatint product line excels in quality and consumer safety. Such a result is achieved by a meticulous routine quality control of the raw materials (vegetal extracts), high manufacturing standards and state of the art microbiological and toxicological analysis of the end product. Herbatint is not tested on animals, is certified by PETA Herbatint hair colours are registered with the UK Vegan Society. It adheres to FSC standards and ingredients are Gluten Free. Bottles have screwable lids so you can save what you don’t use for further applications. A 48 hour skin test advised prior to use. Not for use on eyebrows on beards. chloride, Simethicone, Sodium metabisulfite, Glycerin.. Ingredients : *Aqua (Water), *Citric acid, Cetyl alcohol, Behentrimonium chloride, *Aloe barbadensis (Aloe vera) leaf juice, *Moringa pterygosperma (Moringa) seed extract, *Triticum vulgare (Wheat) germ oil, *Oryza sativa (Rice) bran oil, *Simmondsia chinensis (Jojoba) seed oil, PPG-3 Benzyl ether myristate, Methyl gluceth-20, Ethoxydiglycol oleate, Isopropyl alcohol, Sodium dehydroacetate, Sodium benzoate, Parfum (Fragrance), Imidazolidinyl urea, *Tocopheryl acetate, *Glycerin.